Want edge in your Yoga ? Looking for some irreverence in your path to Zen ? Then "Yoga for Indie Rockers" might just be more your speed. Chaos is a California based yoga instructor that looks like the love child of Jean Harlow and Tommy Lee. She just created a new Yoga DVD, "Yoga for Indie Rockers" that has become a hit. The title caters to the millions of folks who get turned off by the "airbrushed" instructors (as Chaos refers to them), and the serenity vibe of traditional Yoga videos. Chaos has been teaching her classes in Hollywood California to a wild mix of executives, rockers and moms. 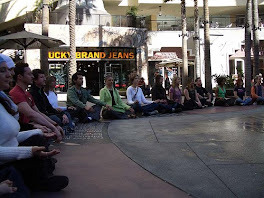 The DVD is meant to get people out of their everyday lives and into their practice by using music to connect them more powerfully to the practice. 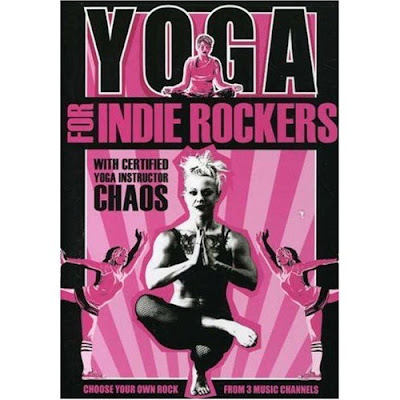 Unlike other Yoga DVD's that fuse this concept with eastern sounds, or meditation tracks, "Yoga for Indie Rockers" adds the sounds of Rage Against the Machine and Marilyn Manson amongst others. Definitely not for purists, this DVD is meant for all those folks looking for a new edge in getting fit using the discipline of Yoga.